(Try saying that title several times quickly). If you are a follower of technology news you will, undoubtedly, have seen somebody writing about Apple Pay. If you haven’t seen anything about it, do let me know how your hibernation was. Of course, you can read and watch all about it on Apple’s page. There’s been a positive reaction to this new way to pay and lots of discussion. And, of course, lots of people writing-up their experiences. Engadget have a good piece comparing Apple Pay and Google Wallet to using a credit card. Of course it’s only available in the US so all the experiences you read about are there. But here, I think there will less of a ‘WOW’ when the system is, eventually, launched. Using the tap/wave approach to paying may be new but the UK has had contactless payments for some time. Suitably equipped phones – while few and far between – have been able to do this for a while. In 2008 (6 years ago, in case you aren’t counting) my bank, Barclays, started issuing contactless cards that allowed a tap payment for amounts under £20 (no PIN, no signature, no handing over your card). I’ve been happily paying contactless for a while to the point where I don’t really notice it anymore. But, I thought I’d pay attention today and see how easy it is. For, if it’s already easy, are solutions like Apple Pay and Google Wallet going to make a big change to payments here in the UK? This morning I took the train into Waterloo Station in central London. A smart-card ticketless system, Oyster, has been in place for years. But recently contactless card payments have been accepted by those little yellow readers. I took my Oyster card out of my wallet months ago and tap on the gates with a credit card. This morning, my wallet comes out of my pocket, I tap on the gate, I get to the train. The card didn’t come out of my wallet. No pressing of any buttons on any device. I don’t think it could get much easier. And, from today, that tap on the station ticket gates also donates a penny everyday to the Mayor’s Fund for London thanks to the Penny For London initiative. No change coming out of my pocket into a tin and I feel a little better doing it. On my way to the office I buy my breakfast, Porridge and a coffee if you’re interested, from one of the massive number of Pret A Manger stores in the city. I order, my pots are in a bag and I tap my card. This time I do take it out of my wallet. No fiddling with change. My colleagues are not in the office at lunchtime so I go for a short walk. It was a very short walk because, today, the tourists seem to be crowding the streets around my office more than normal. I pop my head around Tesco’s front door and see the queue to pay is much shorter than normal at this time of day. A salad and spicy popcorn is paid for at the self-checkout with a tap of my wallet (again, I don’t even get the card out). The biggest hassle here is bagging my lunch. On the way home it’s tap in and tap out at the station. I’m going to the gym so I get off a stop earlier. Contactless payment on London’s transport system is really simple & adoption seems to be picking up. Because I’m writing this piece I logged on to the system’s website. I’ve registered my card so I can download my payment and journey history if I want to. I check the statement and I notice that there were two occasions recently when my tap on the reader didn’t register properly and I am charged a higher journey fee. I update the records and click ‘apply for refund’. I’ve never had a problem getting a refund in the past. I can also see that capping has been applied because the sum of the individual journeys was higher than the equivalent daily travel-card price. I don’t do anything for this to be applied. They also operate a weekly cap but I don’t seem to spend enough with them to hit that very often. On the way home I walk past The Hand & Racquet, a pub on Wimbledon Hill Road. I had a couple of pints there last night with a former colleague and, yes you guessed it, a round of excellent bitter was paid for at the bar with a tap on the handily placed card reader. Not for me the pockets full of change you invariably end up with after an evening in a pub. Dinner, tonight, was already in the fridge but I wanted to pick-up some vegetables to go with it. The Co-operative near my house allows me to pay the £3.30 by tapping. In fact, the hardest part here was having my Co-op membership card swiped. The plastic on that card is separating so it doesn’t go through the reader very easily. And that’s my day. Lots of small transactions all done without cash. In fact, so many of my days are like this I often forget to check I have cash with me so when I do need it, it can be a bit of a surprise. My experiences here are genuine, I didn’t specially pick the shops to write this. If I’d gone to the sandwich shop for lunch then I would have needed cash. Many pubs don’t have the handy card reader and, of course, all my transactions were under £20 which allows the tap and pay. I know many of the mobile payment systems allow larger value payments but, today, I wouldn’t have needed them. I love the advantages of tap-to-pay. With these transactions there’s no automatic receipt and I usually decline them so I’m not stuffing my wallet with ‘a useless paper receipt’ (as I once called them) and, of course, there’s no change lost down the sofa. Author jonPosted on October 30, 2014 April 2, 2017 Categories Miscellany 2014Tags mobile, payments1 Comment on Will Apple Pay play in the UK today? A couple of months ago I wrote a thing about receipts and the utter pointlessness of P, T and M on that piece of paper. Admittedly, it’s not the most exciting piece of writing was it? On the other hand, it appears I’m not alone with this line of thinking. Jack Dorsey, you know one of the chaps that invented Twitter, apparently spoke at the US National Retail Federation’s annual Big Show conference (I suspect they are, close to what I thought was, a receipt industry) about this problem and ways the receipt can be better used as a communication tool to customers. If I was so inclined, I’d claim credit. You know, something along the line of how smart people follow my thinking. But, that’s pretty much a long-shot huh? A little digging is a fascinating thing. It seems all sorts of pieces of paper could be improved with a small amount of design expertise. I was drawn to the idea of improving the receipt during an extended attempt to claim expenses for a recent trip. That trip included a train, a flight and several taxis. I know taxi paperwork is being improved: Uber and Kabbee do a great job of just emailing you the receipt after the journey – no more scribbled bits of paper that are incomplete. How many times have you had to add information to a taxi receipt yourself so that it was obvious what it journey it was for? They’re clear on where I have been and how much the journey cost. And email makes them easy to retrieve when it’s time to claim those expenses from the people that sent you there. As it turns out there are plenty of other people who think train tickets and plane boarding passes could also be improved. These are a bit more complex as, unlike many taxi receipts they have to be shown while the journey is in progress. To that end they contain lots of little nuggets that mean nothing to you and me but might be crucial to the ticket inspector or air stewardesses’ ability to quickly interpret the ticket. I like Neil Martin’s version of the British Rail ticket (others have had a good go too). But for some innovative thinking, take a look at Peter Smart’s version of the airline boarding pass. If you’ve ever had to look twice at your pass to see which terminal/gate you’re going from then this redesign couple be really helpful. What I particularly like about both of the examples I’ve shown is the removal of industry speak. Those little airport codes, you know LTN to WAW, are really London Luton to Warsaw Chopin in real, human, understanding. Why not just say that? Unless the product is a business-to-business tool where the people using the system speak the language of the industry it’s never a good idea to confuse with codes and jargon; and even in industry-specific systems I’m not always convinced. In the airport the departure screens don’t show WAW so why should the ticket? 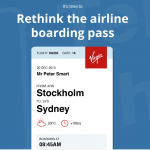 There will be those who think a digital ticket/boarding pass is the solution but that experience needs improving too. My British Airways mobile phone app once showed a partner airline’s flight number for the journey – so the on-board crew were very confused – and I’ve known people who have stood at the front for five minutes or more rebooting a crashed phone so they can show a ticket and take their seat. Paper may be around a while for those things. Now I just need an original idea for something to redesign. Further Reading: This post is a follow up to I Don’t Want A Useless Paper Receipt and is also the third in my BEWA posts. The first a rather random post, BEWA: Sound the alarm! All the letters have been taken. Last week’s post was Elsewhere: Writing the perfect RFP. Sound the alarm! All the letters have been taken. It’s impossible to come up with a new acronym for anything anymore. BEWA, for instance. It’s been used. At least twice. It’s the British Equestrian Writers Association and the Business Educators of Western Australia Inc. It is also a Singaporean fashion brand and a village in Jamtara district of Jharkhand state of India. And I just wanted to start a meme. Not that I really have the ability to do that but, you know, it was an idea. I hear you cry, “A meme? Are you sure?” And you would be right but indulge me for a moment. I just paid the hosting fee for curnow.org to the folks a Dreamhost again. I host my own site on some rented server space there. It’s been with them since 2002 and I can’t remember the company who did it before but I don’t think they are around anymore. The idea was simple: own my own space so I am not at the whim of a dot com business that might not be there tomorrow (this was 2002 and web 1.0’s bubble had well and truly gone bang). I think I was inspired by Phil Gyford’s website and the idea of collecting all my own web content in one place. I once wrote that the reason for building a site like this was because, “The ideals of a less censored form of communication, open and available to all, appeals to some deep belief I have in the basics of human community”.1 Of course those are the wild ramblings of an Web 1.0 idealist and you only need looks at the comments on any newspaper website to see how utterly nonsensical I was being. But, having paid for another year I began to think about why I cough up this money given I don’t really write a great deal here when I could host a simple site for free in many places. Go and check out the beautifully simple curns.me for something along the lines of my original plans for this site. Then, on Monday, somebody asked me about Google search and websites. I know very little about this. So I did a bit of research and looked at the search terms that got people to curnow.org. So, hello all you Ashley Paske fans (for the kids, he was Matt Robinson in Neighbours sometime in the the last century). There’s a reference to him here and it seems to drive people to look. And the picture isn’t there anymore so I will have to look at that and fix it one day. So much for the more worthy stuff I wrote about personalised radio and why we should all stop thinking that news is something that can be easily defined. All this lead me to think that I ought to try and add some new ramblings here just to justify the payment and get people here for some other reason. Which lead to my big idea – BEWA: Blog Every Wednesday in August. Catchy, don’t you think? And so I will try. Don’t hold your breath. Author jonPosted on August 6, 2014 August 6, 2014 Categories Miscellany 2014Tags bewa2 Comments on BEWA: Sound the alarm! All the letters have been taken.